Full classification: Phylum Chordata, Sub-phylum Verbrata, Class Mammalia, Oder Artiodactyla, Family Cervidae, Sub-family Cervinae, Genus Cervus, Species Cervus elaphus scoticus. The red deer is Ireland’s largest land mammal and is the only species of deer that is considered native to Ireland. They earned their ‘native’ or indigenous status, as they are believed to have survived our last ice age or are the closest living population to the post-glacial native Irish Red deer. Although Red deer can be found in most counties the only herd that are believed to be native or indigenous are those found in Killarney. In the 1960’s the Red deer in Killarney numbered 100 animals or less, these animals were brought back from the brink of extinction by the efforts and work of the Kerry Branch of the Irish Deer Society. Now there are approximately 600 – 700 native Red Deer in the Killarney Valley area of Co. Kerry. A small herd of the Killarney Red deer has been translocated to Innismhicilean island off the Kerry coast. The reasons for this was to preserve and conserve their genetic pureness. Two other captive native herds of these animals are held in Doneraile, Co. Cork and in Co. Tyrone. Thus, theoretically, these animals could be used to restock the Killarney Valley if hybridization or serious disease occurs. Adult males are known as stags, weigh up to 220Kg, Females as hinds, weighing up to 110Kg, Offsprings are calves, which weigh 6-9Kg. have a spotted coat until the age of about 2 months old. Summer coat is a deep-reddish-brown colour, spots can occur along spine. The underbelly is cream, as is inner thighs and rump. In winter the coat is shaggy, thick (for insulation against the cold and rain) dark brown-grey in colour, with light patches on the undersides and rump. The caudal patch extends higher over the rump than in most other deer, being a cream colour. The tail has a dark stripe that extends upward along the spine. Age and the condition of the individual animal can seriously affect this general appearance. The metatarsal gland, found on the hind legs is a creamy colour. Red deer are primarily grazers, but other food sources if available are taken advantage of. These include heather, dwarf shrubs and rough grasses such as Molina sp. Found on the uplands. Heather plays an important food source to uphill animals during the winter months, especially if there is snow-covered ground. If the weather is harsh enough then the deer may be forced from the upland to migrate to nearby farmland to feed upon farm crops, this occurs generally at night. 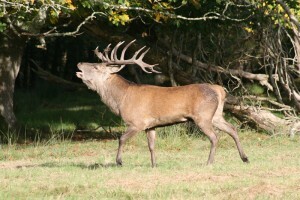 The rut occurs during the month of October and may last up to 6 weeks. 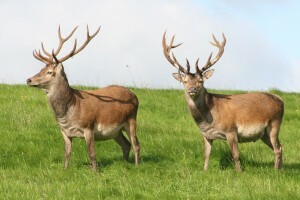 The two sexes are segregated throughout the year apart from the rut. The males congregate to form bachelor groups, these vary in the number of individuals present. They begin to become intolerant of each other from August onwards; this is due to the now increasing levels of the male hormone testosterone. The increasing levels of this hormone stimulates the increase in neck size (mane) and testicle size, as well as the cleaning of the new antlers of the velvet covering, the general thickness of such a mane depends on the condition and age of the stag. The photoperiod or the changing lengths of light and darkness determine the level of testosterone. The hinds begin to congregate in their traditional rutting areas. Sexually mature stags (5-11yrs) take ‘possession’ of hind harems, which they will defend from other stags and herd in any hinds that wander close. Up to 20% of a mature stag’s body weight may be lost during this rutting period, as they tend not to consume much. The rut peaks generally in mid-October, where fighting can escalate, resulting in serious injury and possible death. Many Stags can be sufficiently weakened from the rut, especially older animals and followed by a harsh winter, they may not survive. Calves (singles) are born during the period of late May until early-mid June after a gestation of 229 days. They are born with a spotty coat, which remains with them up until the age of about 2 months. This dappled coat camouflages the calf until its mother returns to suckle it. Suckling occurs on average every 2-3 hours during the first few days, after which the time lapse is greater between feeds. The mother wil return to the area where she left her calf, and call to it with a short bark to locate it. Interestingly enough, that apart from the rutting and calving calls, both sexes are generally silent throughout the rest of the year, unless emitting an alarm call. Antlers are cast between Mid-March and April and regrown every year, so they are in their prime for the rut. Older Stags tend to cast earlier than younger ones. The antlers form in Red deer is of many branches of multi-points, the number of which can vary considerably with age, condition of the stag. These antlers are used in fights during the rut. Red deer fight characteristically by pushing and shoving the opponent by the antlers, untilone is pushed backwards, at which point the winner will chase off the loser. They can cause considerable damage in young broadleaf woodland, eating the leaders and side shoots and also in agricultural crops. 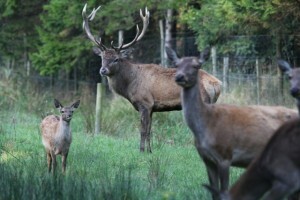 Red deer are extensively farmed for their venison.